Gone are the days of boring, dull looking, cubicle-driven and drab workplaces. It’s 2018 and the new age offices are nothing short of an attractive hub of productivity! In fact, an unlikeable workplace is one of the major reasons that might discourage potential top talent from saying yes to a job offer. Your office space speaks volumes about your work culture and it is in the best sense, a reflection of the way things are done in your company. The way you design your workplace has an important effect on the morale of your employees. 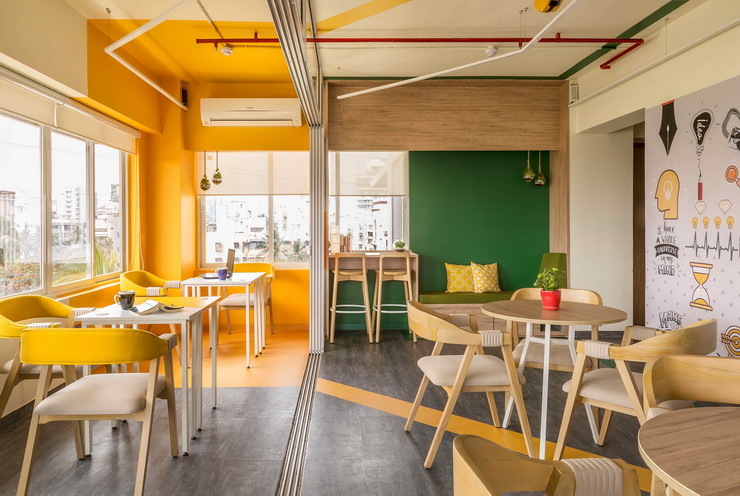 From funky workstations such as colourful bean bags to a fun game zone, offices are upping their game in terms of offering their employees a well-designed space. This is true especially in the case of startups. Let’s understand some ways to design a startup office that perfectly balances beauty and productivity in an optimum fashion! How To Design Startup Offices That Balance Beauty And Productivity! Here are some ways to ensure your startup office is a perfect blend of aesthetics and practicality! Increasing the natural light in your office is one of the surest ways to improve wellness and boost energy levels. Research has consistently shown that access to sunlight is critical to well-functioning minds and bodies. Employees who get plenty of natural light tend to sleep better, focus better, exercise better and live better. Design your office space in a manner so as to allow ample daylight for all your employees. One of the ways to do that is to have more windows in offices. In a research, it was found that offices that featured windows provided 173 percent more white light than offices without windows. That’s probably why employees in those offices got an average 46 more minutes of sleep than their windowless counterparts. 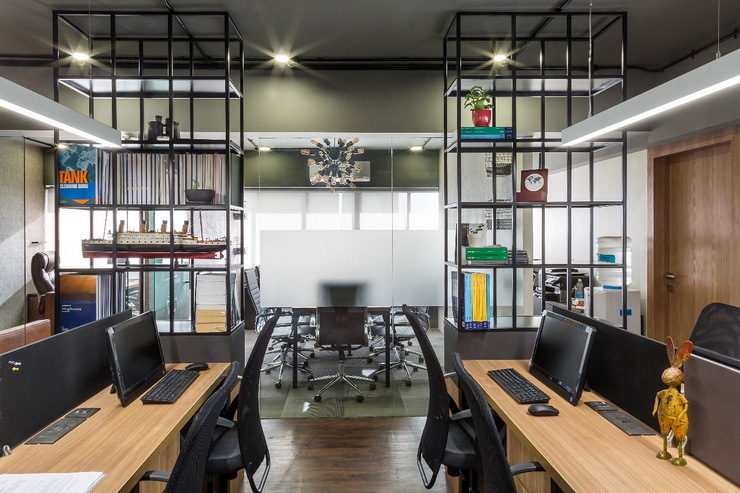 Simply installing a glass partition rather than a fibreglass cubicle can increase the amount of light that flows through the entire office, and that can get energy and productivity soaring. 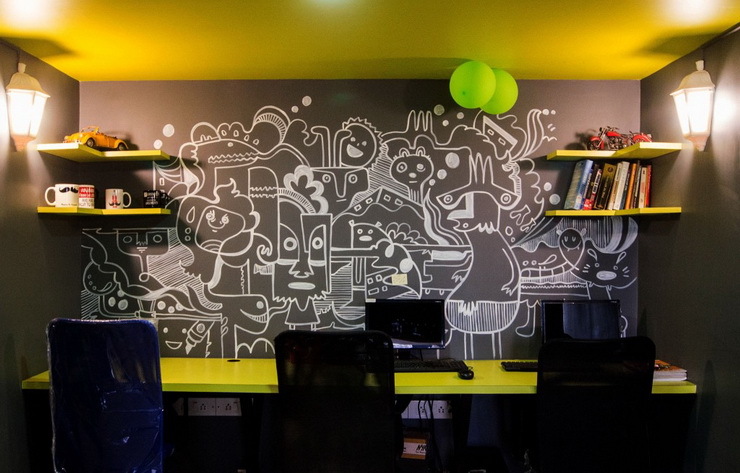 A startup is not your typical corporate job which has the surety of a 9 to 6 workday! In fact, it is anything but that. Startups are dynamic, fast-paced and evolve each day. Their workspace needs can change drastically within a short period of time. Therefore, it is advisable to opt for designs that are flexible, as far as possible. While chalking out the layout, consider the shape and size of the office space, with flexibility being the key to success. Since startups usually employ the young generation who like working on the go, go for flexible seating options such as bean bags, as far as furniture is concerned. This will also help save space by doing away with bulky desks. Use versatile and multipurpose furniture which can be easily moved around. Startups are always buzzing with activity and one of the best ways to keep the people around motivated is through the use of some vibrant colours. Nobody likes to work in a monotonous office, especially not the millennials! The right colours will add energy to the workplace and make working all the more fun. Incorporate hues of blue, green, yellow, red etc on the walls or in furniture. Studies suggest that colours play with the psychology of human mind, so make the best use of them to enhance positivity in your startup. You can also use your brand colour in different parts of the office to signify the love for the brand and create a cohesive looking space. Open floor plans are an extremely popular modern office design that has hugely caught up with the startup ecosystem. Open offices let companies reduce costs and foster more spontaneous collaboration. Employees no longer feel the need to remain restricted to single cubicles. In fact, they like to move around and strike up a conversation with their colleagues. Employees are more equipped to better ideation, brainstorming and innovative sessions which may lead to new ways of thinking. In fact, 70% of offices in the US follow an open floor plan set up in offices, and it appears that the trend is clearly going to replicate in India too. While open offices are the way to go, studies also suggest that they can have their own set of disadvantages. Open offices are noisy and can get distracting for employees, thereby affecting their productivity. Some employees handle disruption better than others, but being in the middle of a hectic office can hinder performance and make employees feel more stressed. If a worker needs to focus on an assignment or even just to take a personal call, they should have somewhere to go to do so. Design your workplace which has the perfect blend of open office space plus separate areas for employees to work in privacy. Having a variety of workspaces that are suited to different work styles and tasks is the key to ensuring that every employee can do his or her own work. There is a common misconception that relaxed work environments lower productivity. Giving your employees a place to unwind when things get overwhelming is a great way to help reduce stress around the office. Work hours can get crazy for employees and the best way to help them is by delegating a space for them to relax and come back feeling rejuvenated. Fun elements such as a ping-pong or pool table, foosball, creative colouring books for adults are all ideas that you can implement. You can also have a separate cafeteria within the office that is brimming with fresh supplies of coffee and snacks, for your employees to just hang out for a while, or in fact, have a meeting with a colleague over a cup of coffee. Adding personality to your workplace can inspire and motivate you. Whether it’s a photo of your family or a poster of your favourite quote, adding a personal touch to their individual workstations let employees perform well. In fact, any aesthetically pleasing art is good for the mind. It’s proven that working in a space surrounded by artwork leads to an increase in creativity. Not to mention, if you are meeting with clients, it makes your space feel more welcoming and professional. Let your employees experiment with pen and notepad organizers, peel and stick wallpapers for their desks and even personalised mugs. These endeavours fill a workplace with positive energy and productivity. Designing a startup office is all about having the perfect strategy to bring comfort and elegance together, thereby helping your employees stay productive and happy! Get in touch with experts who can help you design a better office!